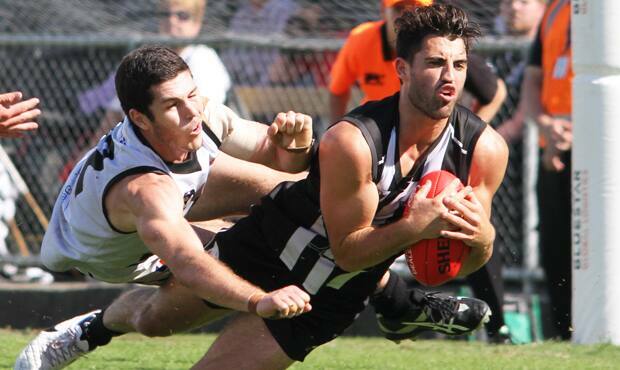 Alex Fasolo takes a diving mark in front of his North Ballarat opponent after being swung to full forward late in the final quarter of Collingwood's 12-point win at Victoria Park. Photo: Shane Barrie. In some games, teams manage to hold an edge over their opponent all day yet are never able to put their counterparts away on the scoreboard. Fortunately Collingwood stood up to the pressure against North Ballarat in the first round of the VFL home and away season on Saturday afternoon. Sitting on a two-to-three goal lead all afternoon, the Magpies were in control in general play but never far enough ahead to feel truly comfortable on the scoreboard. It was inevitable that the Roosters were going to eventually mount a challenge, but it still appeared to catch the Magpies by surprise when they kicked their way into the lead. “We pushed him forward,” VFL coach Dale Tapping explained after the match. Fasolo became Collingwood’s focal point at full forward in the closing 10 minutes, twice marking strongly in a contested situation and goaling with the first of his two set shots to nudge his side back in front. “Because he competes really well in the air he drew the attention of not only one other opponent but two,” Tapping continued. Ferguson stole the show when he kicked the sealer with minutes remaining. Keeping the ball alive tight in the forward pocket, the diminutive left-footer paddled the ball to advantage and kept it alive on the boundary line before baulking three Rooster opponents and slamming the ball home from the goal line. Ferguson dances around one of three opponents before kicking the sealer. Photo: Shane Barrie. View Lachlan Ferguson's player profile. Ferguson, who is shorter than Jarryd Blair at 170cm, was a revelation in his 13 VFL games last season and started 2014 with a critical four-quarter effort at half forward. His tackling and forward pressure make him a favourite of teammates and coaches alike, but it was his two goals that pleased Tapping the most. “I think Fas probably contributed to that. He drew the attention of the other defender so when the ball was at ground level, Ferg was there doing what he should be doing, supporting the ground ball. That’s his role, basically. “It was good for Ferg to hit the scoreboard. The match was a battle of attrition as both sides went hell for leather in a hot start to the new season. “It was just a really hard game of footy. A really tough day,” Tapping reflected with hints of both exhaustion and relief. “There were moments there where we had control of the game but we couldn’t convert or take our chances, with three goals and seven behinds in the first quarter. “Credit to North Ballarat, we could never shake them off. It was always that 12-, 14-, 16-point margin which still gave them a sniff to get at us, which they did. “They probably conserved a bit of energy in the third quarter with their ball movement. They started to chip it around with short kicks and maintain possession with a ball-retention game plan, which we were fully aware of pre-game as to how they would attack it. “They fuelled themselves up to just launch in that last quarter, which they did. “In the first 10 or 12 minutes they were really damaging. We just couldn’t get the ball off them or get in a position to slow them down, which we did reasonably well for most of the game. “But having said that, our guys responded really well to the challenge, I thought. The game was there in the balance, we got headed twice so to respond on both occasions, I said to the players that’s it’s a good trait to have and it won’t be the last time that will happen. We’ll have games like this again and we’ll reflect and refer to this experience today. Of the individual players, Tapping had praise for Lachlan Keeffe, Josh Thomas and Ben Kennedy, who left his mark on the game when he went back with the flight to mark courageously during the second quarter. “I thought Kenno worked really, really hard all day as a mid, both on and off the ball. “He showed great courage in the second quarter to run long and hard to sit under a high ball and take what was coming. I thought that was a real highlight for me with regards to his game. “I’m pleased for him because his attitude towards the game is really positive. “Keeffey is getting better each week. He certainly led the charge down back with his leadership. “JT got valuable game minutes again. I haven’t seen the numbers but I’m sure he would have got a fair bit of the footy, but it’s more his work inside as a mid and going into the half forward role that he’s played at AFL level, he was good. Ben Moloney, who was the captain for the day in the absence of the injured Jack Hellier, didn’t let his side town. “Ben really stood up. He looked a bit gassed early in the last quarter but he had a real influence in the last 10 minutes. “There’s a lot to like about it but I think there’s a lot of improvement with our group, there’s a lot of improvement. *Jake Williams is Collingwood's nominated 23rd man. The 23rd player rule is designed to enable clubs to promote young talent and provide them with a taste of VFL football to aid their development.